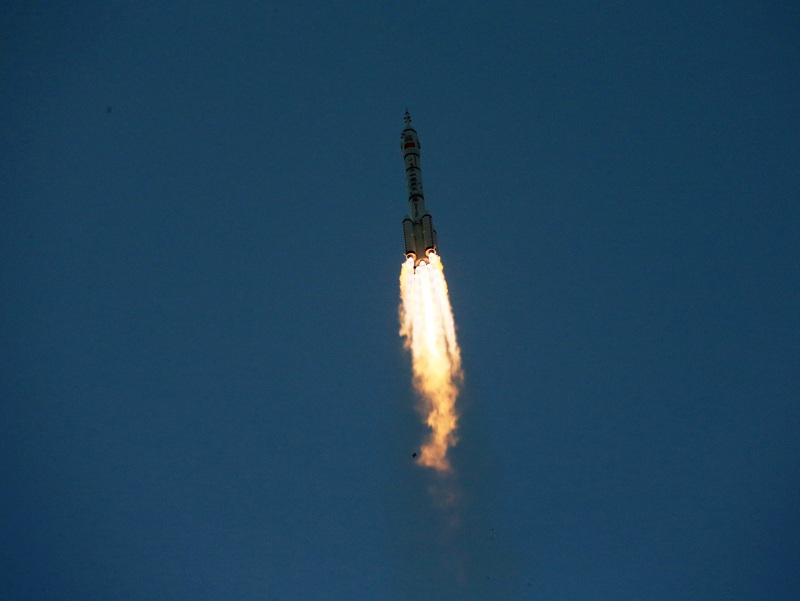 The Shenzhou-11 spacecraft with Veteran Commander Jing Haipeng and first-time flier Chen Dong began a two-day commute to the ‘Heavenly Palace’ at dawn on Monday when blasting off from the Jiuquan Satellite Launch Center in the Gobi Desert. Successfully lifted into orbit by the Long March 2F rocket, Shenzhou-11 raised its orbit and completed a fully automated approach to Tiangong-2 on Tuesday, culminating with a successful docking at 19:24 UTC. 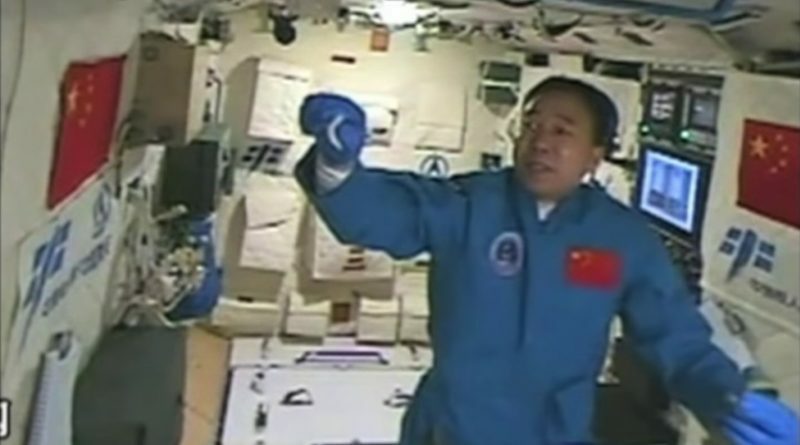 Commander Jing was first to float inside the space station module to conduct a cursory inspection before inviting Chen to join him aboard their home in space for a mission of 30 days. 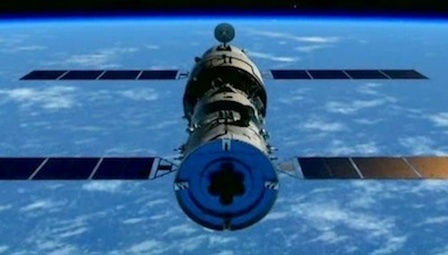 Tiangong-2 was placed into orbit back in September by a Long March 2F and marks China’s final stepping stone to prove the technologies needed to operate a large modular space station set to begin deployment before the end of the decade. In addition to serving as a technical testbed, Tiangong-2 also hosts China’s most advanced space-based science facilities launched to date. 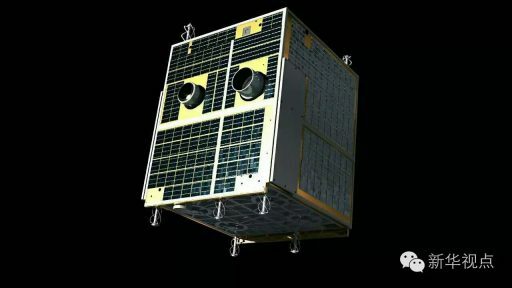 Similar to the first ‘Heavenly Palace’ launched in 2011, Tiangong-2 hosts a combination of crew-operated and remote-controlled payloads on its interior and exterior to allow the spacecraft to be of use when no crew is on board. 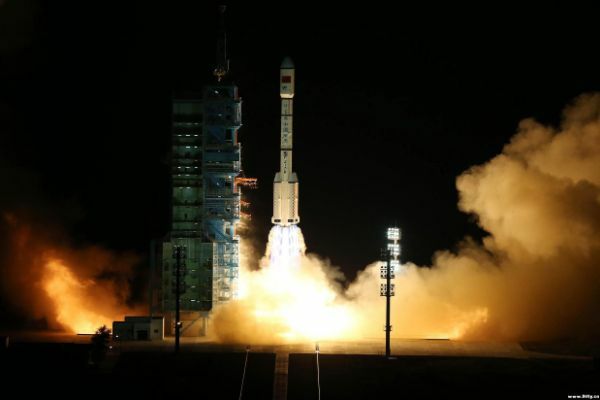 At 14:21 UTC on Thursday, Tiangong-2 fired up its engines for a very slight de-boost of its orbit by around four Kilometers, based on orbital tracking data collected by the Joint Space Operations Center. With a full month spent aboard Tiangong-2, Shenzhou-11 is China’s first mission that allows the crew to enter an actual living and working routine in space. The two crew members will work at least eight hours a day, six days per week, not counting meals and one hour of daily exercise performed to counteract muscle loss over the course of the medium-duration flight. A diary entry from commander Jing, published by people.cn, provides a glimpse into the crew’s tight schedule. In the diary entry from the day of the crew’s arrival on Tiangong-2, Jing notes the two crew members have been extremely busy, even forgetting they had heated up a meal that they eventually ended up skipping, but expected to make up for at dinner. Over the course of their mission, the two crew members will perform experiments from 14 different areas with special focus on biology, space life science and technological demonstrations. A pair of plant cultivation experiments are being run on Tiangong-2 to study how the microgravity environment affects the growth of rice and romaine lettuce. Reportedly, the rice germination experiment had been on Tiangong-2 since its launch and was initiated prior to the crew’s arrival to provide sufficient time for germination and the plants growing before they have to be harvested prior to Shenzhou’s return to Earth. Gaining insight on how gravity affects the growth of plants is of value on and off the Earth. Cultivating plants in space for crew consumption will be an integral part of future missions to distant targets requiring small-scale experiments in orbit to perfect space-based plant-growth facilities of the future. Knowledge on how plants grow and what mechanisms are influenced by gravity can also improve crop yields on Earth. In addition to these cultivation experiments, Shenzhou-11 is flying a number of plant seeds including peppers, zucchini and different types of pumpkin that are exposed to the space environment for five weeks before returning to Earth. Growing plants from these seeds will reveal whether germination and growth properties are affected by exposing seeds to the space environment for an extended period of time. Riding to Tiangong-2 alongside the crew was an animal enclosure hosting a group of six silkworms for a study proposed by Hong Kong students. The experiment aims to obtain silk, made by the worms in microgravity, and compare it to silk from Earth in terms of its strength. 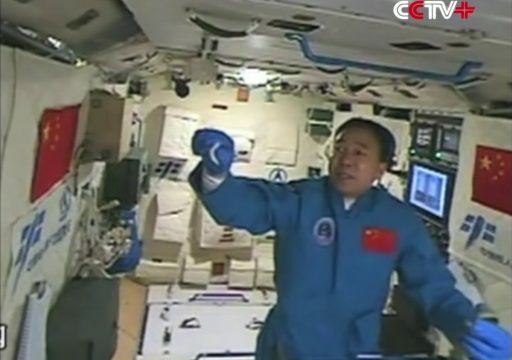 On Friday, one of the silkworms got an experience of floating freely inside Tiangong-2 when Jing Haipeng demonstrated the experiment in an educational video shot by Chen Dong. Also on Friday, the second plant-cultivation experiment was set up, aiming to grow romaine lettuce onboard Tiangong-2 and harvesting samples for return to Earth and laboratory analysis. Similar studies on the International Space Station were able to harvest reasonably large lettuce plants after being grown for a month and the same is hoped for this experiment. The most important test subjects flying on Tiangong-2 are the two astronauts themselves, venturing into previously unknown territory by doubling China’s previous space endurance record set by the Shenzhou-10 mission. Although the mission is only considered a medium-duration flight, spending a month in space will affect the crew’s physiology in a number of areas. Muscle and bone loss become evident around the one-month mark in the mission, and temporary vision changes after flight may be experienced by the crew. 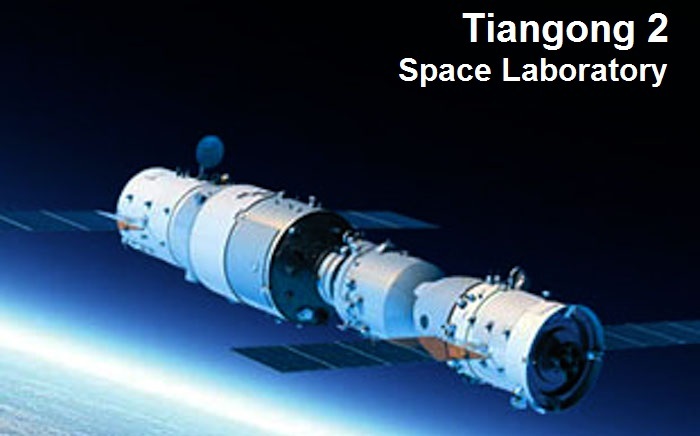 Tiangong-2 hosts different medical facilities including an ultrasound device employed for regular scans of the crew member’s cardiovascular and pulmonary systems to track degradation over the course of the mission. 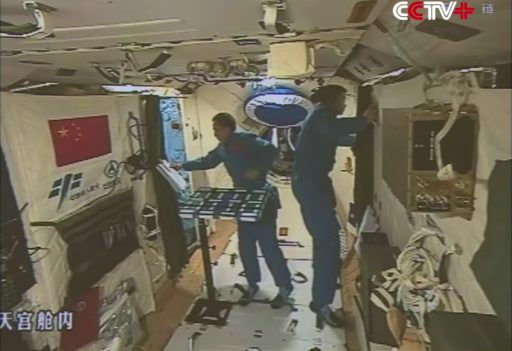 To begin the evaluation of countermeasures to cardiovascular and muscular degradation, Tiangong-2 hosts a pair of exercise facilities. Once China deploys its modular space station, the typical mission duration for a resident crew would be around 180 days, making countermeasures an absolute necessity to keep up the crew’s health. Evaluating exercise devices as part of the Tiangong missions will provide valuable insights into design changes needed to optimize the devices for operational use. 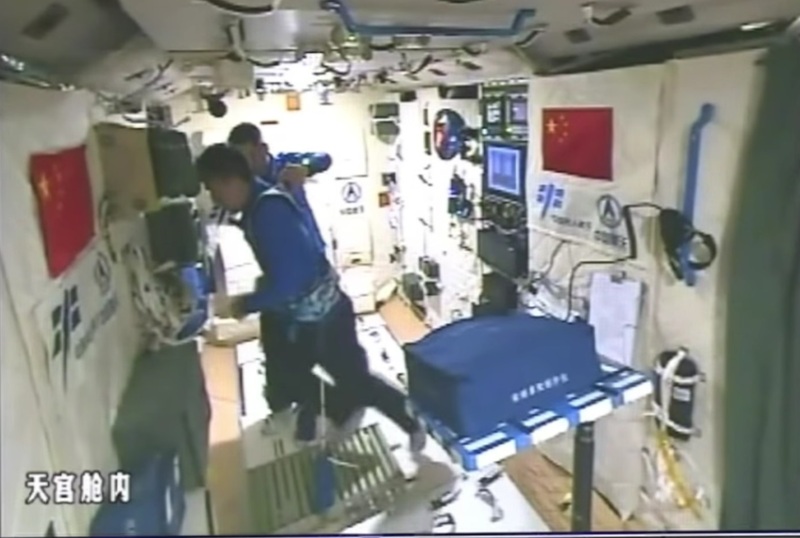 Video released on Friday shows Chen Dong exercising on what appears to be a relatively basic treadmill device, at least compared to the advanced treadmills currently in use on the International Space Station. Cinched down using a pair of flexible straps, Chen attempted to run on a series of rollers and struggled visibly – requiring the help of his commander to steady him. Lessons learned from these test exercises will inform the design of future systems to ensure China’s can realize the goal of extended missions of six months. Having entered their routine life in space, the crew can also enjoy some of the new amenities aboard Tiangong-2 introduced based on the recommendations of the crews that visited the Tiangong-1 spacecraft in 2012/13. 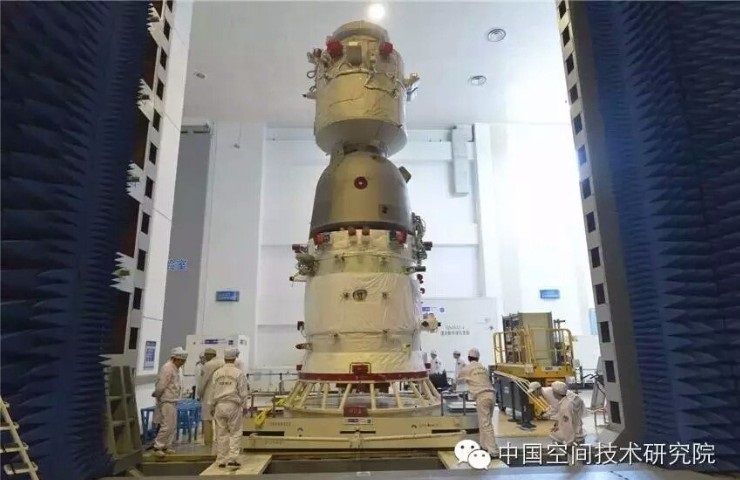 Jing Haipeng who was part of the Shenzhou-9 crew and visited Tiangong-1 in orbit remarked that the second Heavenly Palace is more comfortable in part due to an improved layout. 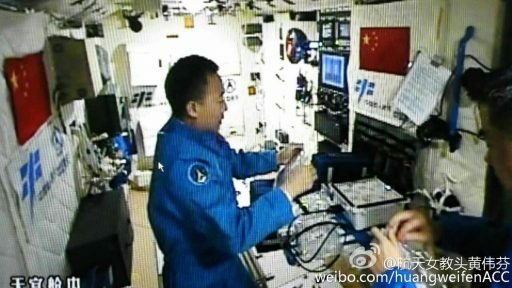 Changes made on Tiangong-2 after TG-1 flew range from simple, but important adjustments of foot holds and hand rails to more advanced changes such as the introduction of a wideband communications system that allows the crew to remain in contact with the ground on multiple video, voice and data channels. 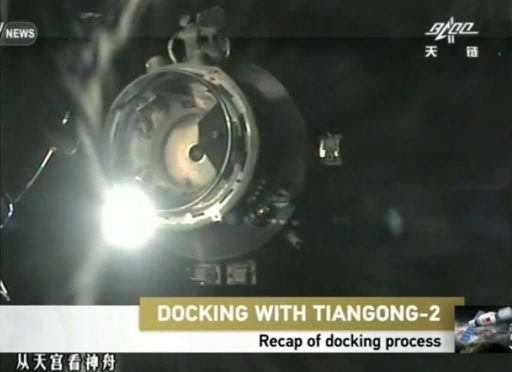 Almost continuous communications are possible through the Tianlian data relay satellites in Geostationary Orbit as shown by the continuous video coverage of the docking and ingress without any major video gaps. In-flight entertainment options for the crew include TV programs and music uplinked from the ground and they can phone their families whenever they wish to do. To make the crew’s stay more comfortable, engineers went through great lengths to make the acoustic environment more benign. The constant buzzing of fans and electronics as well as the operation of life support systems are among the most frequent complaints from astronauts spending time on various spacecraft including the Space Shuttle and International Space Station. 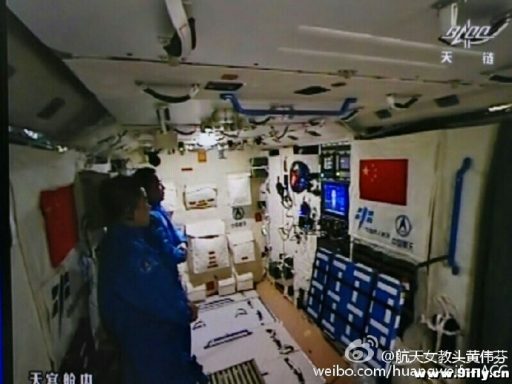 The ambient acoustic environment on Tiangong-2 should be less than 50 decibels and the crew can make use of noise canceling equipment to ensure they can get a good night’s rest. Upcoming this weekend is another highly anticipated event of the Tiangong-2 mission – the release of the Banxing-2 satellite that has been riding piggyback on Tiangong-2 since launch. The satellite is outfitted with a precise attitude determination and control system and an ammonia-based propulsion system for proximity-flying with Tiangong-2. BX-2 carries a series of visible light cameras including a 25 Megapixel camera and wide-angle imagers to collect photos of the space laboratory in orbit with the spectacular backdrop of Earth. 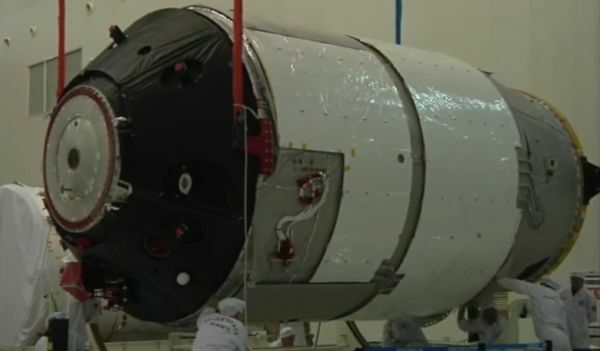 According to reports, Banxing-2 will follow Tiangong-2 at close range for several orbits before opening the gap to a few Kilometers where it will continue to shadow the space laboratory.